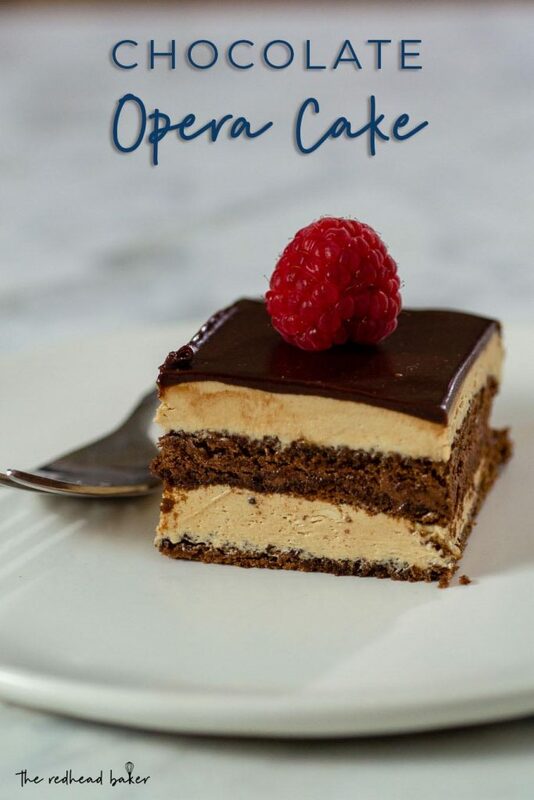 Chocolate opera cake is a slight twist on the traditional French dessert, with thin layers of chocolate cake, coffee buttercream and chocolate ganache. I attended culinary school for two years. Three mornings a week, we started the day with a 5-hour Production “class”—making all of the treats that were sold in the school’s bakery, which was open to the public, or served in the school’s restaurants. Production was divided into stations, so you might be working on bread, cakes, pantry (making buttercream, pastry cream, or other things that went into finished desserts), or oven station. One of the desserts we sold in the bakery was French Opera Cake. It was my favorite of the cakes we offered. No one is quite sure how it came be called Opera Cake. Dalloyau, a Paris-based patisserie, claims that the grandfather of the company’s current president created the dessert in 1955 and named it after the Opera Garnier. There was a reference to “opera cake” in a newspaper advertisement for Patisserie de Grand Hotel in 1899, but no picture, so who knows if it was the same dessert now known as opera cake. Traditional French opera cake is made up of layers of almond jaconde (a type of sponge cake), separated by layers of coffee buttercream and whipped chocolate ganache. Once assembled, the whole cake is topped with a chocolate ganache glaze, and the sides are trimmed so you can see all of the delicious layers. Time-consuming to make and assemble? Yes. Worth it? OMG, YES! In this version, I swapped the almond sponge cake for chocolate cake (the kind typically used in chocolate jelly roll cakes). The cake layers are soaked in coffee simple syrup, which helps keep the cake moist while it’s stored in the refrigerator (cake typically dries out in the refrigerator). This showstopping cake is so delicious and so rich, just a small square is more than enough to satisfy. It is not a difficult cake to make, as far as technique goes, but it’s sure to impress nonetheless. Preheat oven to 325 degrees. Line a 13x18-inch rimmed baking sheet with parchment paper or a silicone baking mat. Grease with butter or nonstick baking spray (NOT cooking spray). In a small mixing bowl, whisk together the cocoa powder, flour and salt. Set aside. Bring about an inch of water to a boil in a saucepan. In a large mixing bowl, beat together the eggs and sugar with a hand mixer. Once the water in the saucepan comes to a boil, reduce the heat to simmer the wate. Set the mixing bowl over the water, continuously beating the egg mixture with the hand mixer until it lightens in color and doubled in volume. Remove the mixing bowl from the double boiler (do not discard the simmering water, you'll need it again later). Continue beating the egg mixture another three minutes or so, until it is very thick and sits on top of the rest of the mixture for 5 to 10 seconds when a spoonful is dropped into the bowl. Sprinkle the dry ingredients over the egg mixture, and use a spatula to gently but quickly fold them together. Scrape the cake batter into the prepared pan, and use an offset spatula to gently spread the cake batter to cover the whole pan. Bake for 5 to 6 minutes, until springy to the touch. Remove from the oven to a wire rack to cool. Combine the water, sugar and espresso powder in a small saucepan. Bring just to a boil over medium-high heat. As soon as the mixture boils, turn the heat off and let the mixture cool to room temperature. Bring the water in the bottom pan of the double boiler back up to boiling. In the bowl of a stand mixer, combine the egg whites and sugar. Whisk over the boiling water until the sugar dissolves. Place the bowl on the stand mixer and, using the whisk attachment, beat the mixture on medium-high speed until medium peaks form. If by then the whites are still hot, lower the speed to medium-low, and continue whisking until the bottom of the mixing bowl is just warm to the touch. While the meringue is cooling, combine the Kahlua and espresso powder in a small bowl. Stir until the powder dissolves. Once the meringue has cooled down, switch to the paddle attachment, and begin adding the softened butter, 1 to 2 tablespoons as a time, mixing on medium speed between each addition. Once all the butter is added, turn the speed up to medium-high and beat until the icing is fluffy. Lower the speed to medium low and drizzle in the Kahula/espresso mixture, then return the speed to medium-high until the buttercream is uniform. Transfer to another container, and clean out the bowl and the whisk attachment for making the ganache. Place the chopped chocolate in the bowl of a stand mixer. Place the cream in a small saucepan. Set the heat to medium, and bring just to scalding. Keep a very close eye on it -- with this small amount, it won't take very long. Pour the hot cream over the chopped chocolate and let stand for 1 minute, then whisk until smooth. Measure out about a third of the ganache to a separate container that can be warmed over a double boiler or in the microwave. Set the remainder aside to cool. Once the larger portion of the ganache has cooled, whip it with the whisk attachment of the stand mixer until it forms a thick and fluffy icing. Lay a sheet of parchment on a cutting board. Use a knife to release the chocolate cake from the edges of the jelly roll pan. Flip the cake onto the parchment paper, and peel away the parchment or silicone paper that the cake was baked on. Arrange the cake so that one long edge is facing you. 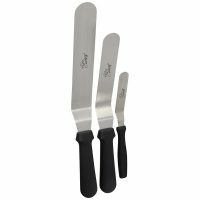 Use a sharp chef's knife to cut the cake into three rectangles about 4 inches by 9 inches each. Place one of the thirds on a rectangular cake board. Brush with about third of the coffee syrup. Spread about half of the coffee buttercream over the cake in an even layer. Top with another third of chocolate cake. Brush with another third of the coffee syrup. Spread the beaten chocolate ganache over the cake in an even layer. Top with the remaining third of the chocolate cake. Brush with the remaining coffee syrup. Spread the remaining half of the coffee buttercream over the top in an even layer, getting the top as smooth as possible. Chill the cake, uncovered, in the refrigerator for 15 to 30 minutes. While the cake is chilling, gently re-warm the reserved ganache, either over a double boiler or in the microwave for 30-second bursts, stirring in between each burst, until it reaches a pourable consistency. Remove the opera cake from the refrigerator and gently smooth the top of the icing with a non-patterened paper towel (Viva paper towels are great for this). Have a large offset spatula at the ready, and pour the chocolate ganache over the opera cake. Use the spatula to swipe the ganache smooth and nudge it to the sides and corners of the cake. There isn't much time to do this before the chilled cake starts to set the ganache, so work quickly. Place the cake back in the refrigerator another 30 minutes to chill the ganache. Trim the cake: run a very sharp chef's knife under hot water, wipe it dry, and cut off one edge of the opera cake. Rinse the knife under hot water, wipe it dry, and repeat with another edge. Repeat until all four edges are trimmed. If you like, you can scrape any remaining ganache from the bowl into a piping bag and write the word "Opera" on the top of the cake. Chill the cake again until the ganache is set, then cover in plastic wrap and store the cake in the refrigerator for up to 3 days. I’d love to make this but reading through the assembly instructions, I’ve become a bit lost. At first glance, your photo shows what looks like a very thin bottom cake and a regular slice of cake in the middle…so only two layers of cake? With the assembly instructions, the last three seem to be out of order…if I am to get three layers of cake, shouldn’t the ganche layer be the last thing I do? (so cake, buttercream, cake, buttercream, cake, ganache?). Please clarify or point out my reading error….it wouldnt be the first time I misread a recipe…. The whipped ganache is the same color as the chocolate cake, so what appears to be one regular thickness layer of cake is actually two thin layers of cake with whipped ganache in the middle. So, it goes, cake, buttercream, cake, whipped ganache, cake, buttercream, poured ganache. Perfect sense!! Thank you sooo much, I’ll be making this today!